HDV: FX1 + iMac + iMovie HD = ??? On January 22nd, 2005, Apple released iMovie HD which featured native support for the newly introduced consumer level high-definition video format HDV. This announcement in combination with Sony’s recent release of the HDR-FX1 high definition camcorder marked the first time high-definition video production and editing was available at a consumer level price. But the million dollar question is: Does it really work? Well, I guess it’s really a $5000 question since that’s how much all the equipment cost. Like many others, I was very excited by the release of this camera and was waiting on the edge of my seat for Apple to officially announce native HDV support in their video applications. I was in the market for both a new camera and a new Mac, and my finances happen to be inline for acquiring both. But because I am not a video professional (most of my income does not come from doing video related work), I couldn’t justify splurging on a Dual 2.5Ghz G5 with a matching flat panel. I had my eye set on the lower end iMac G5, in particular, the 17” 1.8Ghz model with a super drive. It actually has the highest price/performance ratio of all the currently available Macs assuming you don’t already have a display (as of 1/30/2005). But I wasn’t sure if it was going to be able to handle HDV editing. I scoured all the discussion forums I could find trying to find an answer to my question. But, the answers were muddy and biased at best. In the end, I decided to go by Apple’s website which claimed a 1Ghz G5 would be sufficient and put in my order for an iMac 1.8Ghz G5 as well as an order for more RAM. I ended up outfitting my iMac with 1.5GB of RAM. Before I talk about using the HDR-FX1 with the iMac G5, I feel that it’s important to cover exactly what HDV is and its relationship to the HDTV. HDV stands for “High-Definition Digital Video” and specifically refers to the specification for recording high-definition resolution video onto the common mini DV (Digital Video) cassette tape. This specification was officially announced on September 30, 2003 and is backed by Canon, Sony, Sharp and JVC. A notable exception from this list of camcorder manufactures in Panasonic who currently has dominance in professional HD production with their DVCPRO-HD format and has been making noise in the consumer camcorder market with their standard definition (SD) DVX-100 offering 24fps recording. JVC was actually the first to introduce an HDV camcorder with the JY-HD10. However, it was somewhat of a lack luster release using only a single CCD sensor and allowing 720p recording. Sony’s HDR-FX1 released in November of 2004 was the first HDV camcorder to really get excited about because it used 3 CCDs to give reasonable low-light performance and noise levels and generated a full 1080i signal. Of particular relevance to the HDR-FX1 are the pixel dimensions of 1080i video in the HDV and the ATSC specifications. HDV provides only 1440 horizontal pixels while the more familiar ATSC specification has 1920 pixels. The HDV format uses a 4:3 aspect ratio image to store 16:9 anamorphic video when using 1080i. When transmitted to a HDTV television, the image is appropriately stretched to undo the horizontal squeezing during recording. This will be more important when talking about working with HDV video on the Mac later. It’s also worth noting the HDR-FX1 doesn’t have 1440 pixel wide sensors, but only 960 pixel wide sensors. They use a technology called “Pixel Shift” to tease a higher resolution out of fewer sensors. You can find more info about that on Google. Also of great relevance when talking about editing HDV content is the MPEG2 encoding, a video compression technology that utilizes similarity in adjacent video frames to reduce the overall needed data rate. This is good for packing high-quality video into a small space, but it not very good for editing. Since the compression technique operates on groups of pictures, when you change one frame you have to recompress the other images that depended on it. This is going to play a big role in working with HDV images for editting. Standard DV and DVCPRO-HD do not use cross-frame compression and each frame can be manipulated independently from adjacent frames. Okay enough techno-talk. What happens when you plug in the FX1 into an iMac running iMovie HD? Nicely, the interface changes to accommodate the 16:9 format video and some interface details indicate the use of HD content. I’ve highlighted them in the picture to the left (click to enlarge). Because of the compression used with HDV, capturing video is NOT real time. Though the video plays off the camcorder in real-time and is copied to the hard drive in real-time, the iMac has to decompress/transcode the video into an editing friendly format. This is done in parallel with the spare CPU cycles as the HDV video stream is being copied to the hard drive. When the playback on the camera stops, a modal dialog box appears asking you to wait until the remainder of the buffered video on the hard drive is decoded. I observed an average of 1/2 to 1/4th real-time on my iMac. This process can apparently be done entirely in real-time on the Dual 2.5GHz G5. If you open the captured video in Quicktime Player, you can get more info about the captured video. There are a couple of interesting things to notice. First on the left, you can see that the data rate is 12.8MB/sec. This is substantially higher than the 3.2MB/sec used for standard DV, even though HDV is supposed to use the same 25Mbits/sec data rate and uses the same tapes. This due to the decompression step described above as you can see in the screenshot on the right. The native resolution of the video footage is 1440x1080 and format is the “Apple Intermediate Codec” used for editing. When you play it back, it will display at 1920x1080 stretching the pixels. However, the 17” iMac only has a 1440x900 display, so it will have to be viewed at less than 100%. Similar to DV, Quicktime will use low-fidelity fidelity playback for viewing HD video. It also worth noting that I only got 15-20fps during playback. Editing HD content on an iMac G5 was very similar to the early days of editing DV. Response is reasonable but a little sluggish sometimes. Just doing cuts is very easy and effects don’t really work in real-time. In fact, the preview window in my iMovie was partially garbled. Their HDV support still seems to be a little buggy. Working with HD content on an iMac may make you yearn for a faster computer, but it is certainly passable and eventually gets the job because many tasks (including import and export to tape) can be done as non-real time steps. As long as you are patient, it works. Something that is not very well advertised either on Apple’s of the HDV info websites is that exporting back to tape is a very computationally intensive task since it requires recompressing the video from the intermediate codec back into HDV compatible MPEG2. Even on the current fastest Mac (a dual 2.5 Ghz G5), it is 1/3rd to 1/5th real time to recompress the video (for every 1 minute of footage it takes 3-5 minutes to recompress) plus the time it takes to actually record to tape which is 1x real time. On the iMac 1.8GHz G5, exporting ran about 1/12th to 1/15th real time. So, a 5 minute short film would take about an hour and half to finally get it onto tape. Fortunately, this is an entirely hands-off process after you set it starting. You could set it to go when you go to sleep, and when you wake up, it’s ready to go. I did have some strange errors with the time code and video stuttering when trying to print to tape artificially generated video, such as a leading black screen. This may have been because iMovie was trying to render the black screen in real time out to the camera. The stuttering went away when I used actual HDV footage to cap the ends my test movie. I attribute this bad behavior to a slightly buggy implementation/integration of their HDV codec with iMovie HD. I am sure this will get fixed quickly. Though, in practice, it is not likely that you would be interested in going back to tape very often since nobody but yourself (or those individuals who are fortunate enough to also have an FX-1) can watch it. And trying to watch HD from your camcorder can be a little awkward, not to mention it induces more wear and tear on to your camera. Unfortunately, there is no readily available delivery mechanism through which consumers can share or distribute HD content yet. So, the only way to watch the material is either on your computer or by printing it back to tape and watching it on an HDTV capable television. Rendering out back to tape can be a pain, and the video formats and computers capable of viewing 1080i video in full glory are still slightly out of reach for most. Consumer HD technology is still a bit immature and although you can now shoot and edit HD. Watching and sharing HD conveniently is still about a year or more away when high-definition DVD recorders such as Blue-Ray or HD-DVD arrive. Quicktime 7 and H.264 (as well as WMA-HD) are the computer based offerings for viewing and exchanging high definition video. But to view high-definition material at 100% still requires a very high end computer by today’s standards as well as a 1920x1080 capable monitor which are also rare. In my opinion, it’s probably best to shoot in HDV but edit in standard definition DV with a DVD target for now. The FX-1 provides real-time down conversion of HDV content to DV over firewire which looks surprisingly good over component video output compared to true 1080i material. More detail about this later in this write-up. If you must go back to tape, you should be aware that you are taking another generation hit by recompressing it back into HDV compatible MPEG2. Simply taking the video off tape and then putting back onto tape requires 2 recompression generations beyond the compression done at the initial record time. In the few tests I ran of just taking footage off tape and then back on with no effects, there were occasional block artifacts that would appear in moving objects with very noisy/detail textures such as the hairs on my cat. They did not occur very frequently, but enough to be an issue with those obsessed with image quality. Though I would consider myself partially in the category, the fact that I will not likely be going back to tape very often (especially not for a final target) makes this much less of an issue for me. iMovie HD leaves quite a lot to be desired by those familiar with a more sophisticated editing environment such as Final Cut Pro. However, Apple has not yet announced native HDV support in Final Cut Pro and Final Cut Express HD isn't due, from what I gather, until February 15th. Though soon, Final Cut Express is a crippled version of Final Cut Pro. So, it is still not incredibly helpful. However, it is possible to use iMovie HD as an HDV capture tool and edit HDV material in Final Cut Pro HD today. 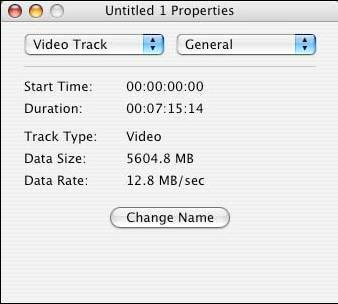 When you capture footage in iMovie, it saves decoded the footage as Quicktime files inside your iMovie project package. Simply control-click/right-click your project package and choose “Show Package Contents”. Your captured footage is in the Media folder. Drag those clips out to a place accessible by other applications. 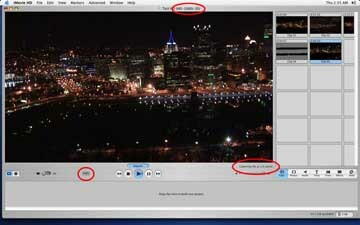 Open the footage files in Quicktime Player and open the Get Info panel. Select the video channel and go to Size. Though the video is only 1440x1080, the descriptor data says it should be played back at 1920x1080. This is going to be problematic when importing the clips into Final Cut because it is going to try and re-render the clips at 1920x1080. So, you have to manually adjust the playback size of these clips to be 1440x1080. This doesn’t do anything to the actual video data, just changes the header information. 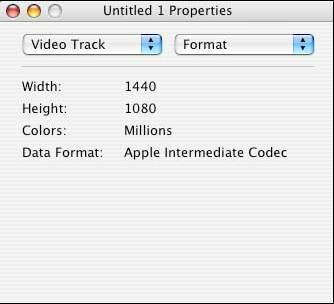 When iMovie HD is installed, the Apple Intermediate Codec becomes available to all Quicktime applications. 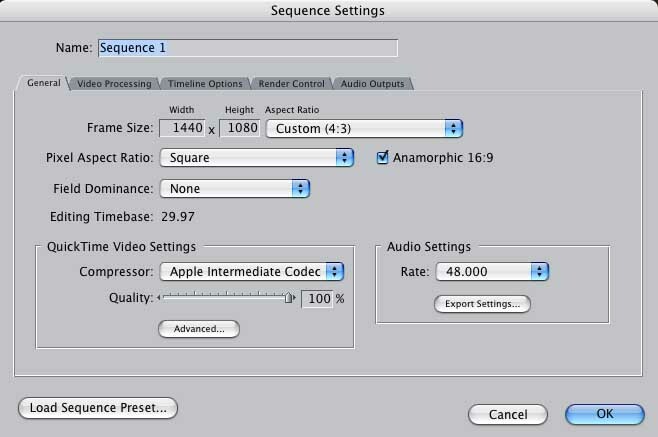 When you import your footage, make sure to set those to also be Anamorphic 16:9. After you do that, you can then drag your clips into the timeline and they will play perfectly without having to render them. Effects can also be done in real-time with RT Extreme. However on the iMac, the real-time effects stutter severely and generally need to be rendered before viewing (just like the early days of DV). But it’s relatively quick and not too much trouble. Scrubbing is also reasonably fast on an iMac G5. 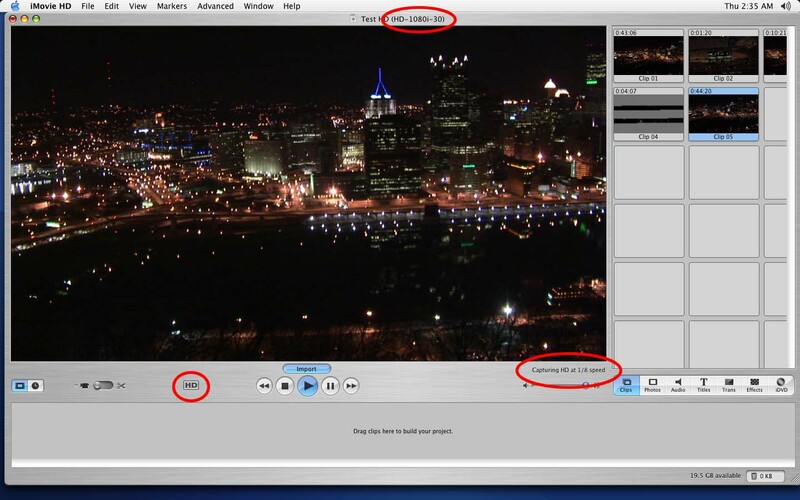 Once you are done editing, you can then export your final movie to Quicktime using the Apple Intermediate Codec. Then you can take it back into iMovie to export to your camera or go to DVD. I’m guessing the reason why they haven’t yet released native HDV support in Final Cut Pro may concern some of the buggy behavior I’ve observed in their HDV decoder implementation and better integration with FCPs logging and batch capture tools. They may also be trying to tune performance of the decoder or even offer uncompressed editing support (though not likely). I don’t know. But, I am pretty impressed with working with HDV material in Final Cut Pro HD on my little iMac thus far. I can only assume that their delays for supporting HDV in FCP HD are for a good reason and that they are only striving to make it that much better. Working with HDV material isn’t as smooth or fast as standard DV, but that’s to be expected. For light duty HDV work, the iMac does indeed work. You just won’t be able to take advantage of the real-time features that standard DV allows. So for now, it is for the brave, tolerant, and patient. But in another two years with substantially faster computers and readily available high-definition video DVD burners and players, working with HD content should be a breeze. Well, it’s been two and a half years and I finally got around to writing this section. A lot of things have changed and some things have not. Apple finally went Intel. Many manufacturers now offer HDV cameras and HDV is now making its way into consumer grade handycams. Sony has even released its follow up to the FX1, the FX7 and the V1U. I’ve also ditched my iMac and upgraded to a dual 2.5GHz G5 tower with 4GB of RAM all in the hopes of being able to crunch through HD material from my FX1. Waiting this long to add my review to the FX1 was partially due to lack of time, but it has allowed me to develop a mature opinion of the camera not just based on features but on solid experience working with the camera along many dimensions. So, what are my thoughts on the Sony HDR-FX1? The short answer is that I recent sold it for a different camera. And for what? - a Panasonic DVX100B. "Blasphemy!" I’m sure many of you will say. But, I will explain why this apparently illogical action becomes quite logical when you consider the FX1 and the HDV offerings of today like the Sony V1U or the Panasonic HVX200. Firstly, I will say HD is very nice. And if you have paying clients that demand HD, there isn’t much question about what kind of camera you should buy. HDV will give a very nice image. It’s not anywhere near the HD quality you get on network television, HD-DVD/Bluray movies, PBS or BBC. It’s about half-way in between SD and broadcast production HD. If you must have HD for professional video production reasons, there’s no question - buy an HD camera. But for everyone else, after 2 years of trying to work with HD material the bigger price tag of an HDV camera will NOT be your biggest concern in the end. Editing - As I mentioned before, I got a dual G5 2.5 GHz tower Mac a couple years ago. A little out of date by today's standards, but still a hefty machine. I sunk $4000 into this machine trying to make it do HD editing, and it does - but it’s still frustratingly slow and there's never enough storage space. HD material swallows storage space unimaginably. Even though you can get 500GB drives for $120, it's still not enough and you find yourself looking into external SATA enclosures and controller cards which start to add up quickly. What made me realize the foolishness of my seemingly never ending struggle for more speed and storage was helping out a friend who was doing a new project in standard definition. She was using a machine that cost half as much as mine and it ran like a dream. Editing was so light and easy, effects previewed in real time, the interface was instantaneously responsive, and working with dozens of hours of material was simply a non-issue. A 500GB drive will hold 40 hours of SD video. To get an equivalent editing experience working with HD material today would require $10,000 of computing power and storage. Instead, her $2000 machine was running like a dream and the images she had and the story she was telling were still gorgeous even though it was only standard definition. I was sitting on a killer SD editing system and I had no idea. I was foolishly trying to cram HD material down its throat getting frustrated rather than enjoying the process of creating content. Sharing - Once I created the HD material, there is still no cost effective way to share it. HD-DVD burners and Blu-ray burners still cost $600-$1000 and the media is $10-$20 a pop. If HD video is your business, this is not a problem. But otherwise, this is an extremely expensive proposition considering a DVD burner is $30 (or free because you probably already have one) and media is 25 cents. And how many people do you know who have HDTV’s with blu-ray players? How many of them do you want to share your videos with? The most common way people will see/watch you videos now and in the upcoming years is over the internet via YouTube or the high-resolution alternatives. In which case, standard definition video is still considered VERY high-resolution. Image Quality - HDV is "nice". It’s not amazing. It’s nice. It’s cripser than standard definition. That is not too controversial. But, it DOES NOT look like production HD or HD movies. It’s about half way between standard definition and production HD images... and HDV still images are garbage which mean doing image editting/color adjustments is garbage. They are heavily compressed and the color space is small. If you attempt to do any color correct to your HDV content, you easily see these artifacts and they are distracting. The FX1 and other prosumer grade HDV cameras produce "low-end" HD images which are marginally better than the "high-end" DV images provided by cameras like Panasonic DVX100B. The only prosumer grade camera that I think is unquestionably better in overall image quality than the DVX100B is the HVX200 recording HD to their P2 solid state memory card system. But, a DVX100B can be gotten for about $1000 while a HVX200 with P2 cards would run about $7000. And remember, a DVX100 was good enough to win the Sundance Film festival award for cinematography in "Iraq In Fragments". You would be better off buying multiple DVX100’s and doing multi-camera setups rather than investing a lot of money into rapidly changing format. Future Proofing - One argument for buying HD is to "future proof" yourself. But, the prosumer HD format is changing rapidly and the tape-based HDV format may be gone with 3-4 years. Solid state/disk based recording is already popping up and will make tape based recording seem archaic just like USB disks made floppies archaic. Only time will tell if I’m right, but I believe the worst way to future proof your investment is to dump a lot of money into a volatile HD recording medium. DV is old, but it’s far from busted. A great DV camera will likely be useful longer than an awkward, intermediate format HD camera. Other equipment - a good editing station has two pieces of equipment besides the computer and camera: a good video monitor and a playback deck. A computer monitor is no substitute what a video monitor gives you: better color/contrast, proper edge cropping, proper framerate/frame drawing, and image controls. If you want to see how your material will be seen by others, you need a video monitor. A decent SD monitor will cost $150-$300. The HD version will run you $1000-$1500. Additionally, a dedicated play back deck is essential if you don’t want to send your main camera off to repair in a year or two. Capture and playback can eat away at the lifespan of the tape transport mechanism in the camera. An HDV playback deck/camera will run about $1000-$1200. An cheapo SD camera that does a fine job transferring video over Firewire can be gotten for $100. True 24p vs 60i->simulated 24p - I spent weeks pouring over ways to do this trying professional conversion programs, writing my own Final Cut Pro filters to carefully figure out how to get good 24p out of a 60i HDV camera like the FX1. I used to dismiss the "24p hype" as well... hype, until I did some side by side work with the FX1 and the DVX100. HDV 60i can produce true 30p SD images and off-cadence 24p SD images by down-sampling the even/odd frames of the 1440x1080 images to 720x480. I used to be a big proponent of 30p images as an adequate alternative to 24p. And off-cadence 24p can be obtained by carefully picking the most temporally appropriate field from 60i material wasn’t bad. But, neither of them are as nice as true 24p material when compared side by side. 30p is pretty good but it’s a bit too smooth and off-cadence 24p is jumpy. True 24p material feels different and is inexplicably captivating when viewed side-by-side. Something strange is going on in the subconscious visual processing mechanism in our brains that makes this so. I watch in amazement as people can't seem to take thier eyes off relatively mundane material simply because it was recorded at true 24p. The V1U does provide true 24p HDV, but the other aspects of HDV (high compression, and poor color space) turned me away. While I was very excited by the promise of the Smooth Slow Motion recording feature of the V1U to provide 240fps recording. The image quality was aweful compared to the HDV recording. The quality loss is so intensely dramatic it was too blurry for even SD targets. It would only be acceptable for story telling purposes if your target was YouTube. I could either spend $3,000 and get a fantastic standard definition setup (camera and editing station) or try to spend $15,000 to get the equivalent HD system. If I were doing video production for a living and generating income with it, I would definitely go HD. But, as a filmmaker, a hobbyist, and generally someone who wants to enjoy making films rather than fighting with the equipment - HD is overated and not worth the trouble it currently still is to work with. The DVX100 is arguably the best standard definition camera you can buy and it will be useful for a decade to come. Considering how cheaply it can be bought, you could throw it away in a few years and waste less money than investing a lot into a cutting edge, but soon to be obsolete, HDV camera. Written by Johnny Chung Lee on 8/1/2007. Copyright 2005-2007.